We start with light blue stripe seersucker and make a John John or longall. The John John/longall shoulder straps fasten with 2 black buttons on each shoulder. 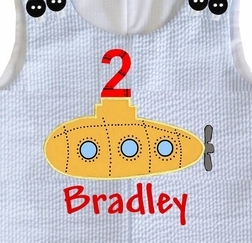 On the front, we applique the cutest yellow submarine that we designed and had digitized. It is our original design and won't be seen in any other shop. 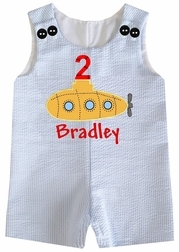 You can choose your number for the periscope depending on the number birthday your little one is celebrating. You can choose to have a name monogrammed in red under the submarine.